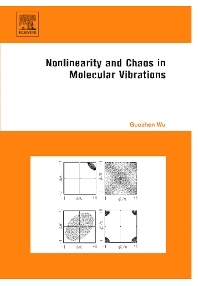 Nonlinearity and Chaos in Molecular Vibrations deals systematically with a Lie algebraic approach to the study of nonlinear properties of molecular highly excited vibrations. The fundamental concepts of nonlinear dynamics such as chaos, fractals, quasiperiodicity, resonance, and the Lyapunov exponent, and their roles in the study of molecular vibrations are presented. The 20 chapters cover the basic ideas, the concept of dynamical groups, the integrable two-mode SU(2) system, the unintegrable three-mode SU(3) system, the noncompact su(1,1) algebraic application, su(3) symmetry breaking and its application and the quantal effect of asymmetric molecular rotation. Emphasis is given to: resonance and chaos, the fractal structure of eigencoefficients, the C-H bend motion of acetylene, regular and chaotic motion of DCN, the existence of approximately conserved quantum numbers, one-electronic motion in multi-sites, the Lyapunov exponent, actions of periodic trajectories and quantization, the H function and its application in vibrational relaxation as well as the Dixon dip and its destruction and chaos in the transitional states. This approach bridges the gap between molecular vibrational spectroscopy and nonlinear dynamics. The book presents a framework of information that readers can use to build their knowledge, and is therefore highly recommended for all those working in or studying molecular physics, molecular spectroscopy, chemical physics and theoretical physics.